I'm so excited to share my first Beeez Kneez project with you all! (I know the post below this has another card from this awesome kit but I made this one first so go with me on this.) Amy asked us all to post a sample of our work today. I am TOTALLY in love with this kit! It has so much to offer! For this post, I made a slightly more embellished card (as opposed to the clean one in the post below) so I could show you a little variety. Everything on my card comes from the Beeez Kneez! The Nikki Silivis stamps are awesome! They give a great, clean impression! I had no idea HOW good clear stamps could be until just last month! And the Pink Paislee glitter alphas are to die for! The two flowers I used came from that set! I glued the pom pom ribbon on with my Glue Arts ribbon adhesive and it turned out pretty well if I do say so. 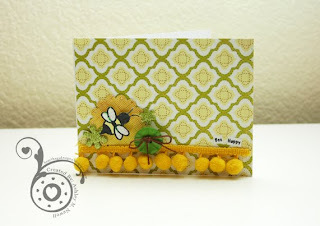 The only addition I made to my card that wasn't in the kit is some Stickles on the bee's wings. You HAVE to check out the Caffinated Cropper blog today for some BLOG CANDY and a challenge with an AMAZING PRIZE!!! I'm crying a little..LOL..Thanks so much!! I am so lucky to have you guys!! I love LOVE did I say LOVE? both of the cards..I'm loving those stamps too...the crispness of the image is amazing!!! The poms poms are delicious! This is one beezin Kneezin card. LOL! Those poms poms are just to cute and love that bee with the sentiment too. You are so inspiring. Oh, I love this card, Ashley!! It's so cute! Very cute Ashley! Love that pom pom trim! Wow Ashley!!! Your card is incredible! Great job! I love this card--Ashley--you AMAZE me every time I visit your site;) LOVE IT! Oh yeah...not all clear stamps are equal. I've definitely learned that! LOVE your card! So cute! I love this kit! The colors are so great and so are all the embellishments! LOVE this card Ashley! That paper is so stinkin fun, can't wait to get my kit! Love this, Ashley! Fabulous the way you used the pom pom trim! Oh my I love this too. That pattered paper is amazing! Oh, I love your card! I'm a huge fan of those yo-yo flowers so I love that you used one there. I really can't wait to use more of my kit...she did such a nice job with the contents I think.